Killer whales are top predators. Their only enemy is man. Feeding behavior is hard to study in living populations because it takes place primarily under water. Although killer whales have teeth on both the top and bottom jaws, these teeth are not very sharp. The killer whale teeth are rather blunt but they do well as "holders" for their prey rather than "biters." 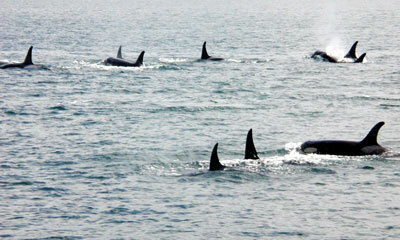 However, the killer whales of the San Juans have been extensively studied to reveal some interesting facts. Fish are the primary food of the resident pods (those that come back to the same coastal areas every summer) - primarily salmon during June and July in the San Juan Islands. The salmon are on their reproductive migration to the coastal streams and swarming in. Resident pods do not need to sneak up on their salmon prey, the salmon come to them. Mammals are the preferred food of the transient pods. The most common food items being seals, sea lions, porpoises and dolphins. Transient pods tend to be smaller, sneaky, and do not stay in one place very long (thus, they are called transients). This is understandable when you think about their behavior when taking marine mammals. Small, sneaky groups can surprise seals or porpoises but, once a prey item is taken the rest of the prey group is suspicious and aware of the presence of the killer whale. After a transient whale takes a seal, most of the seal population in the area hauls out on land, well away from the killer whales in the water. The killer whale is the only whale to prey on other mammals (although not all killer whales take only mammals). 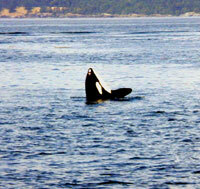 The transients move up and down the coast and are rarely seen in the same place very often. Feeding behavior and preference is apparently learned by the whales within their pod. Once in captivity a new transient whale refused to take any food (fish) from the trainers. As this transient whale began to starve, a captive resident whale (used to eating the fish at the oceanarium) was put in the same tank. The resident whale ate the fish food then brought a fish over to the transient and presented it. The transient began to eat the fish from then on. It seemed like the captive transient did not recognize fish as a type of food and would have starved to death without the help of the captive resident killer whale. Needing between 150 to 300 pounds of food per day, captive killer whales are fed diets of fish. In the wild, killer whales may eat 375 pounds of food per day as they expend a lot more energy swimming around and hunting their food. The residents spend an average of 3-4 minutes per dive and the transients spend 5-15. Most of the killer whales breathe several times at the surface before a dive. They usually arch their back more when making a deep dive than when just swimming along. As you watch the pods of whales you can tell when they are going to dive and be underwater for a time. Then they surface (sometimes very far away from where you last saw them), the whole pod together. Exactly what goes on underwater is not entirely clear.